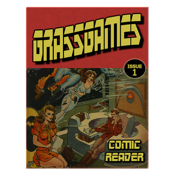 Read your own PDF, CBR and CBZ comics easily with GrassGames' Comic Reader. Simply upload any comics you have on your computer to the App with iTunes and you're ready to go. Supports all rotations, and intelligent fit to screen modes for maximum viewing pleasure. Comes with 3 free sample comics. One universal app - purchase once and have it for both your iPhone and iPad.